The museum of modern art is a must see for anyone visiting New York. Their goal is to collect and display artworks created in the last 150 years which include painting, sculpture, photographs, films and performance, just to mention a few. The fun in visiting museums lies with the ability to captivate and involve its audience and this book does exactly that. Art Making with MoMA is aimed towards children of all ages, it encourages them to learn through a variety of activities, making the art come alive. It uses everyday items that you would have at home and that children would be familiar with. Turning an everyday item into an artwork ignites their imaginations. The book groups activities together into ones that will make a mess, that will require more than one person - a team approach, projects that simply use items at home and the activities that definitely will make a mess. While this book is American, the teaching methods are ones parents can use to highlight different types of art that they are more comfortable with. For instance parents could showcase Australian art or encourage their children to explore art and maybe discover their children have a knack for painting, architecture or furniture design. One of the activities in the book is to design a piece of furniture, a chair. It asks the questions, what features will the chair have, swivel, rock or recline; will it include a back, arms or cushions; what will you use it for? All the while explaining this is what designers think about when creating furniture. It then suggests an assortment of everyday materials that you can use in the design of the chair. The images in the book show that anything can be made from pipe cleaners and cardboard to bubble wrap and paper. 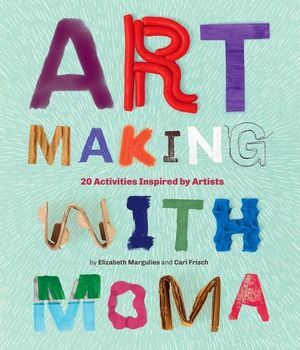 This book has something for everyone to enjoy – play dough, cardboard buildings, dress-ups, wearable sculptures all of the activities are inspired by children making art at the Museum of Modern Art.